I found the oddest thing today: Vintage carded Darth Malgus. I don't even know who this is yet - Old Republic maybe? - but damn, he's cool looking. Anyway, just a head's up since I never knew Bastila was out until she was an eBay exclusive. Good hunting! Malgus is Out! Release the Kath Hounds! And ya he's featured heavily in the story and cinematics of The Old Republic. 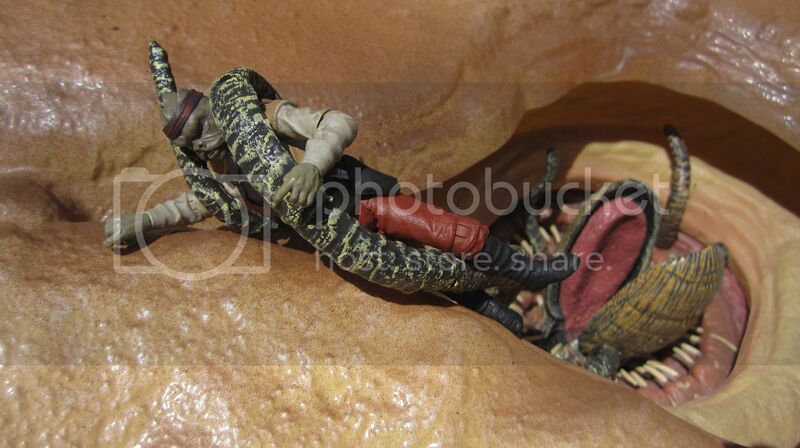 Sandtroopers has pics of a new Battlepack with Savage, Cyborg Maul and Nightsister. This is pretty cool; I never saw armored Savage on the old cards and I'm really surprised they've done the Mother! I might have to get that for the armored Savage. Because that Maul is pretty cool too. The Nightsister Mother I have no strong feelings about though. I suppose it is cool that they made her, but I didn't much care for the Nightsister story arc. That's one nubby saberstaff Maul has. Yeah it is, didn't notice that before. I wonder if it spins on that little disk? Either way, I've got a spare Maul blade laying around somewhere so that'll get swapped out. Darth Maul returns? Did they use superglue? Well Lightsabers cauterize. I think it's possible for some species not to have any vital parts below the waist. -ZacWilliam, I'm assuming "The Dark Side did it." I'm not certain you could really cauterize the large arteries in the lower torso closed. I've got a feeling that it'd be about the same as a lightsaber slicing through a garden hose. That is, assuming Maul has a human-like circulatory system. Yeah. We still don't know in the cartoon how he survived - just that he did. I've never read the comic in which he returned, did they explain it there? Anyway yeah... the Force did it or something. 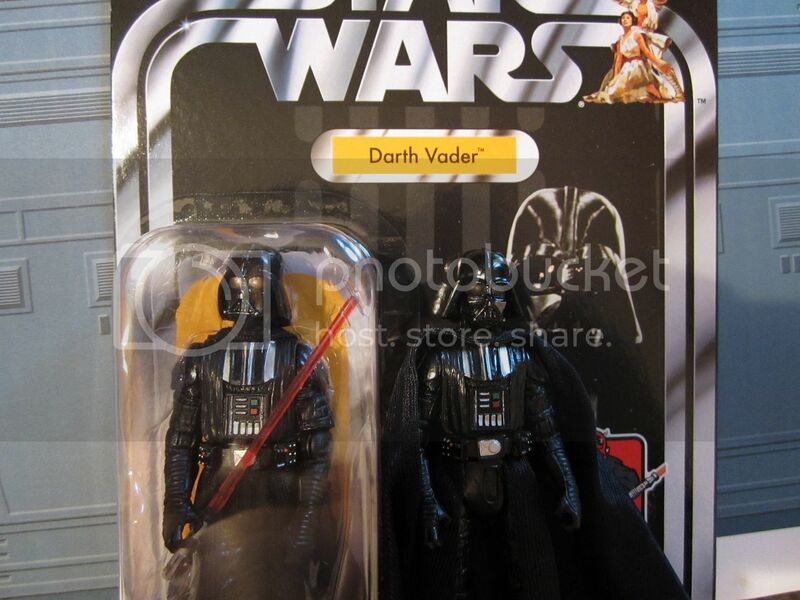 I love the new Vader, but something about the helmet seemed off. I painted the eye lenses black... what do you think? Better? I think I haven't found a single new figure since the Phantom Menace wave, and I'm feeling perilously close to dropping this line like a hot potato for the first time since 1978. I think on that scale, the black lenses look better. They smokey look just doesn't translate well otherwise. I've been thankful for the hiatus in the line honestly, gives me a chance to save some money. I bought my first new figure in a while with the clone wars commando Boss - only to get home and realize he was partially gimped without ankles or knees which frankly pisses me off. So, the more they do like that the fewer I buy anyway. I wonder if the MTT is still even coming out at this rate because I think sales have slowed dramatically based simply on my experiences. It's supposed to be ANH Vader so he's supposed to have the doofy coloured lenses. Yeah, but I can't find a single pic or screen shot that looks the way Hasbro painted them. The original Vader mask had a smokey, slightly gold tinted lens that showed more or less depending on the angle and lighting (I think Sansweet talked about it in one of his books?). You can kind of see it in This pic.. It's mostly a trick of the light along the same lines as Han's "blue" coat in Empire, which is why I don't think it works well when it's actually painted on. They changed the color of the lenses for Vader's mask in Empire onwards. Edited by Dake, 08 June 2012 - 11:15 AM. The ANH helmet had a red-tint to the lenses, but it's only noticeable in a few shots (blowing up Alderaan, TIE cockpit). The helmet was continually modified throughout filming, and it's unknown if the red lenses were present in every shot. Is it still possibly to use steam to take the blisters off cards without damaging them to much? I want to repaint some Vintage Collection figures, and re-use the cards and bubbles. Otherwise, kinda kicking myself for not getting the Gen. Craken when I saw him. Well, I managed to find the new Captain Rex and CW Obi-Wan today. It says something about the current state of this line that it took me a bit to actually realize I was looking at new figures that I didn't already own.